What are the first visuals that comes to your mind when we say hip-hop? Bold rhymes, a hell lot of money, and really rad jewelry are the three essentials that set the genre apart. Hip-hop is flamboyant, and proudly so. If you are a fashion enthusiast, with a penchant for hip-hop, this is the right place for you. Here is our take on the bling gold chains made so popular by the genre. Bling is synonymous with rap music, and rightfully so. Big and bold jewelry pieces sported by your favorite artists are not just a sign of immense wealth. These bold Jewelry pieces also celebrate the struggle they went through in achieving it. Bigger and brighter the bling, the better it is. Cuban link chains, extravagant pendants, and custom-made jewelry are a few of the fashion trends keeping Jewelry enthusiasts busy. Let’s check them out. Nothing says you’ve made it in life quite like a thick gold chain around your neck! These iconic hip-hop fashion pieces add the much-needed swag to your overall look. Pair your gold chain with a satin black shirt or a hoodie and it’s perfection. You can even pile the bling with more bling, i.e. wear gold grills, or pendants for a complete hipster look. Many of your favorite artists have also launched their own old chains online that you can check out. 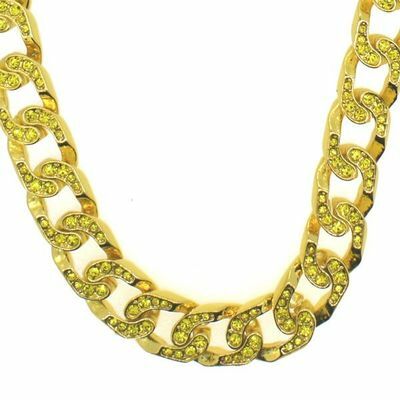 Order your gold chains from credible sources and check the build and design of the chain before buying it. If you’re new to hip-hop fashion, we suggest you start simple and then move on to try out the more bold accessories. A 14k gold link chain, for instance, is a decent and light weight option worth considering. It is neither too flamboyant nor too basic; rather the perfect balance between the two. Plus, a thin gold, white gold (or any other metal you prefer) chain goes well with all kinds of outfits. Cuban link chains are slightly different from rope chains. Link chains can be detached, whereas the rope version has to be worn over the head, because they don’t have any link at the back for fastening. Back in the 70s these chains were longer, heavier and cheaper than the ones you’d find today. At present, people prefer short, sleek gold link chains that can be worn daily. The simple 14k gold plated chain, for instance, comes with stainless steel plating. The design is pretty durable, water-proof and rust resistant- you can wear it anytime, anywhere. Those looking for a more extravagant and bold link chain can choose from the franco, Pearl, Wheat, diamond and snake designs. There was a time when bling was only worn by celebs in music videos and award shows. Now, hip-hop fashion is part of the fashionista’s daily wear. Our favorite artists can look like a million bucks wearing the most unconventional attires and accessories. Unfortunately, the same is not the case with us. We don’t have a team of stylists at our disposal. The most we can do is an experiment and hope it works. Sure, it gets a little intimidating to look different from the crowd, but it’s sure worth it. Quirky neckpieces, for instance, can be paired with an elegant dress or a pair of chic pants giving you the perfect brunch look. You can even pair the custom link chains with iced Cuban link chains - the classic hipster combination. It’s time you move past plain gold chains and start exploring other accessory options out there. Most online stores allow you to place customized orders. You can add colors, cuts and even decide the design of accessory. Add a quirky pendant or medallion to the chain for the added oomph. pendant are iconic pieces of hip-hop history sported by some of the big shots of the industry. We love the gold-plated diamond studded micro Jesus pieces and ankh necklaces. Throw in an elegant well-tailored suit, elaborate hairdo, and some sick shades into the mix and you are perfect. Try to pair the more blingy pieces with plain, bold outfits. This brings the pendant to the forefront, setting you apart from the crowd. Thin or Thick Chain - Which is Better? If you’re a hip-hop fan, your wardrobe is incomplete without trendy gold link chains and Cuban neckpieces. However, before you place your order, here are a few things you must look for in any jewellery piece. Thick chains have a very retro feel to them; they can transform even the most boring outfits into something swashbuckling, making you the center of attention wherever you go. The thin ones, on the other hand, are more suitable as accessories for casual wear, and can be worn daily. The classic brunch look sported by Drake in 2016 is the perfect guide on how to ace the chilled-out chic look. Pair your baggy turtleneck top with skinny jeans, fur boots, and an 18k Cuban link chain, and you’re good to go. Contrary to popular belief, bigger is not always the better option, especially when it comes to buying jewelry. If you’re investing in gold jewelry, make sure you buy it from an authentic source. A 24k gold link chain, for instance, as stunning as it is, cannot be worn every day. These days, gold chains are a shorter, lighter, and simpler than they used to be. Millennials want the minimalistic look that screams of money, not without a dose of ‘carelessly casual’. Hip-hop jewelry has become subtler than what it used to be in yester-years. Sure, there are still moments when rappers show up in outrageous pieces, but that’s more for grabbing eyeballs, and creating a bit of a style statement. Don’t be afraid to mix and match, to experiment with the different jewelry pieces. If your favorite artist can rock the look, so can you!